Winner: 2015 American Graphic Design Awards. | Silver Winner: International Creativity Awards. For nearly a decade, Seaberry has focused part of its design practice on filling the graphic design needs of federal agencies and contractors. Attending countless kick-off meetings has afforded us some unique insights into the development of color strategies for proposal graphics and covers. Our best guide for successful color usage has always been to include the colors of the federal agency requesting service. To our delight, we discovered that the world of federal agencies is quite colorful. There is also a great deal of loyalty to brand colors and concern when brand elements are misused. 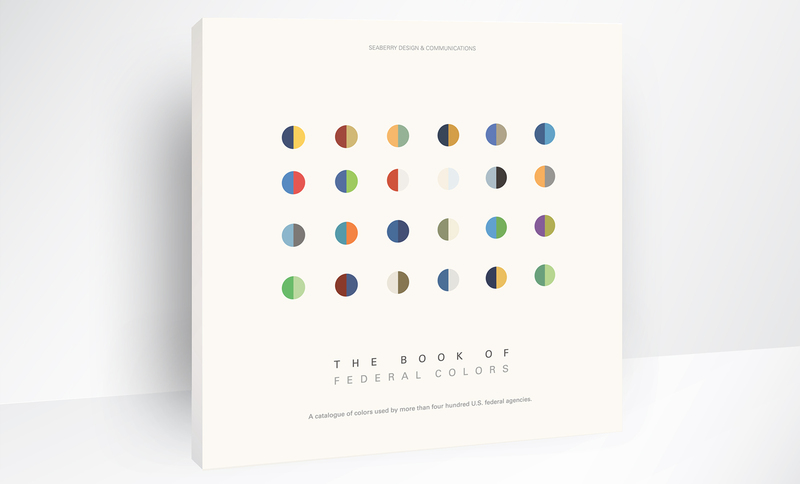 To honor this unlikely design paradigm, we've published The Book of Federal Colors. Stepping back to take a playful look at the universe of federal color palettes, we've cataloged the colors of 411 agencies. The catalogue reveals both the incredible diversity of federal colors and the variety of government agencies.